Over the mountain and through the woods! 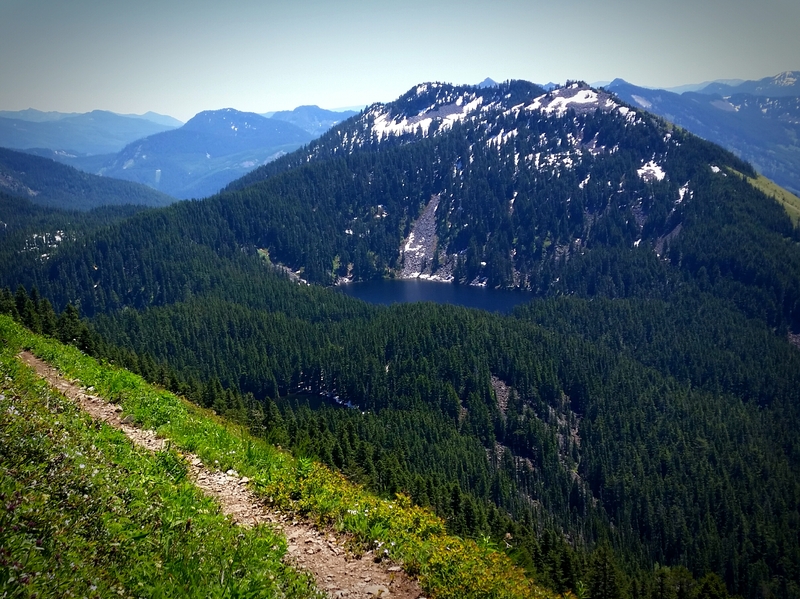 Some time ago I took a trip across my local mountains I called the “HI-90“, during which I hiked and scrambled my way from Mailbox Peak to Denny Creek. Give it a read if you’d like! Well, with a three day weekend and a mini heat wave on the forecast, I thought I’d do just that… er, something like that. 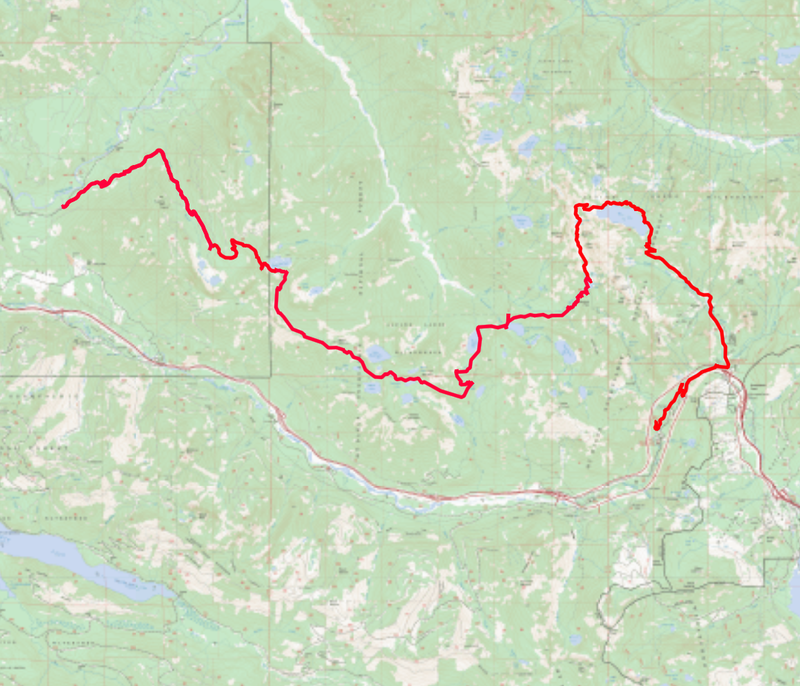 Due to construction at the Granite Creek Connector trailhead, I ended up taking the older Granite Creek Road trail. The trail is on reclaimed logging road the whole way to upper Granite Lake and up to the ridge before the Thompson Lake Trail begins. From the ridge the trail descends steeply to Thompson Lake where one can find a campsite or two. Leaving the lake, the trail climbs swiftly over the ridge separating Thompson Lake from the Spider Lake basin next door. With the first good view across the Spider Lake Basin it was immediately apparent that the traverse to Mount Defiance would be on snow. On the sunny side of Mount Defiance the snow had melted away to reveal bare trail across to the SE Ridge, at which point I headed down the ridge to avoid snow covering portions of the trail. 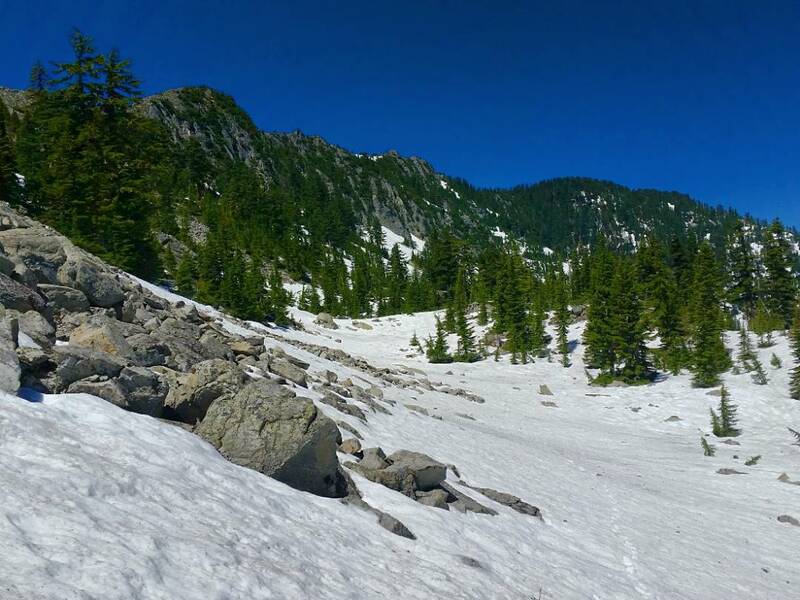 There was still significant snow coverage up around Rainbow Lake until the trail begins to cross Pratt Mountain. At this point my legs were telling me to start looking for a place to spend the night. Not entirely surprising, both Pratt and Tuscohatchie Lakes were absolutely overflowing with humans, so I continued onward. 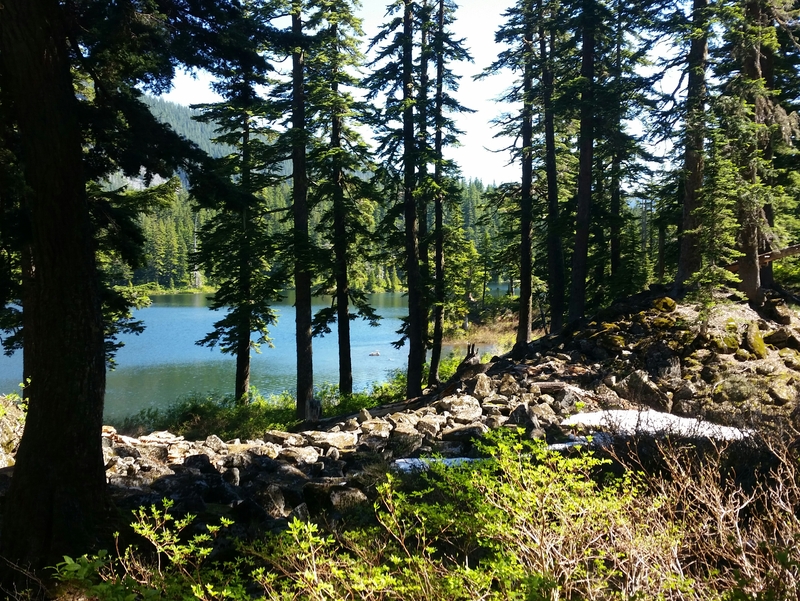 Plodding along up Hemlock Pass in the sweltering heat and with the vague notion that I’d find Melakwa Lake looking like a Walmart Black Friday sale was battering my resolve. I could hear voices from the lake basin as I neared the lake’s outlet. A pair of hikers approached just as Melakwa Lake came into view. It felt like a Christmas miracle. I set up camp and wandered around in the wonderful solitude and scenery. That night the stars were out in full and a curiously warm wind blew down from the pass. This is where that weird barber shop water comes from. I woke up quick to a cacophonous rumble, checked the time and it was 0500. With the quick pull of the tent zipper I was outside watching a rock slide coming down from Chair Peak. I thought it was a pretty great alarm clock! After the usual packing ritual, I was off towards Melakwa Pass and brimming with the anxious electric joy of entering into unknown terrain. The climb up the pass was on decent snow and never extremely steep, views developed with the morning light as I made the ascent. At the top of the pass I got my first view down to Chair Peak Lake and the next bit of route. The grade heading down to the icy lake certainly seemed steeper, but gave me no troubles. I skirted the frozen east shore and scrambled up the high point on the lake’s north side. Here I was standing above and between Snow Lake and Chair Peak Lake. This is where it got a little steep. I finally broke out the ice axe for the next bit down Mt.Roosevelt, I’m glad I only ended up using it for traction… a few of those runouts looked painful. Descending the lower snowfield was much less taxing, in fact I boot skied much of the way. Paralleling the snowy shore was an exercise in deciding when to go up, when to go down and evading the dangers of decaying snow. 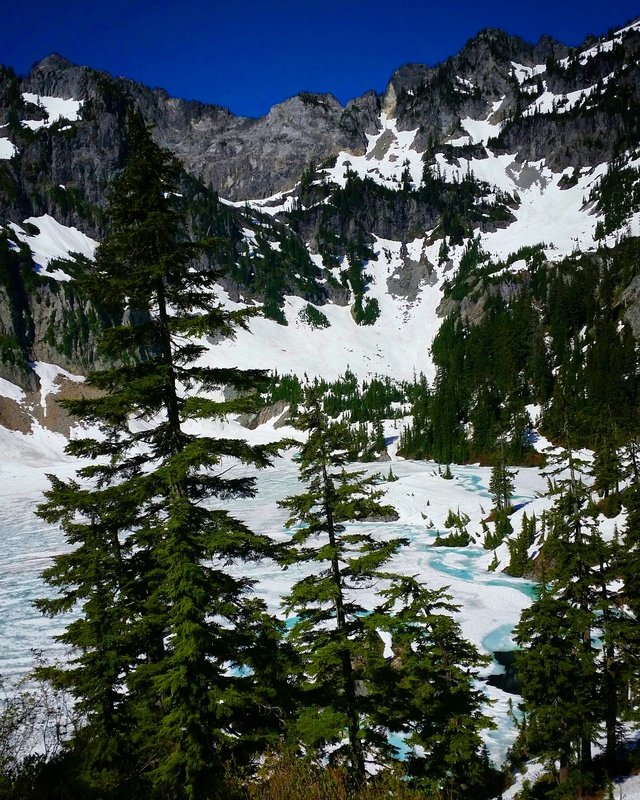 A couple of stream crossings and cliff bands posed challenges as I made my way toward the snow covered Gem Lake Trail. After making first contact with some freshly stomped bootprints, the hiking was gravy. 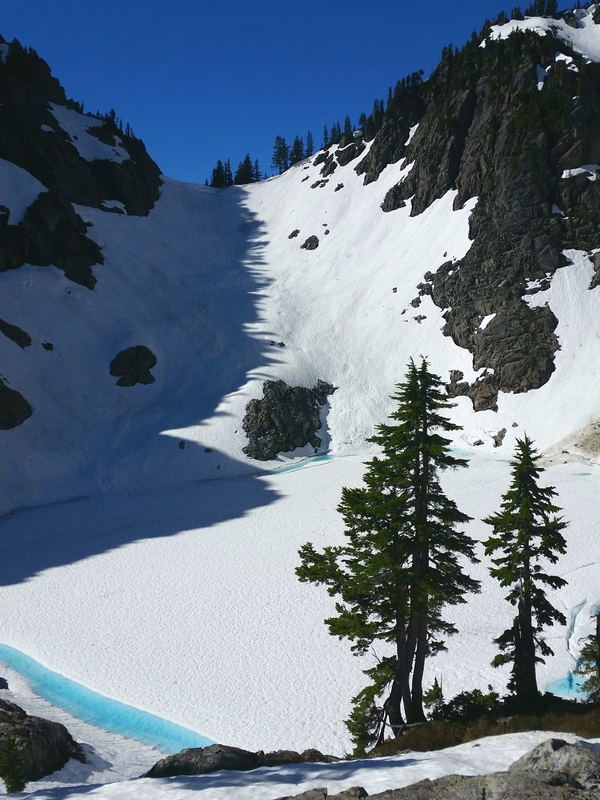 It was mostly snow all the way up to the human covered ridge overlooking Snow Lake, but mostly snow free heading down to Alpental. I hiked the road out of Alpental to the old pass road heading down to Denny Creek, stopping beneath the I90 span over the creek to soak my feet. Well refreshed, I plodded down the road to the upper Franklin Falls trailhead for a quick visit to the much talked about falls. 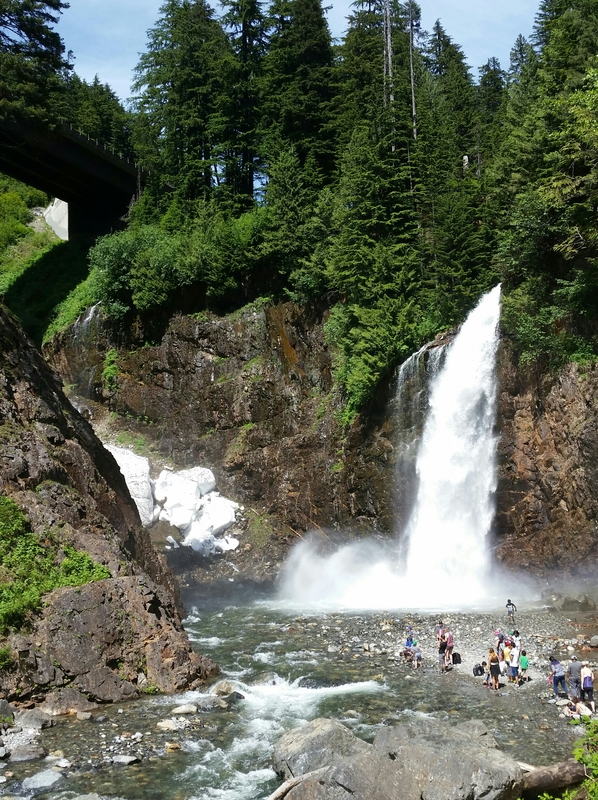 It’s a nice enough place, and there were a lot of people out on the sunny shore enjoying the mist from the falls. It’s a real circus though! They come from miles for the healing waters! Camping space can be a problem during the weekends, plan accordingly. Mountaineering skills are absolutely required. 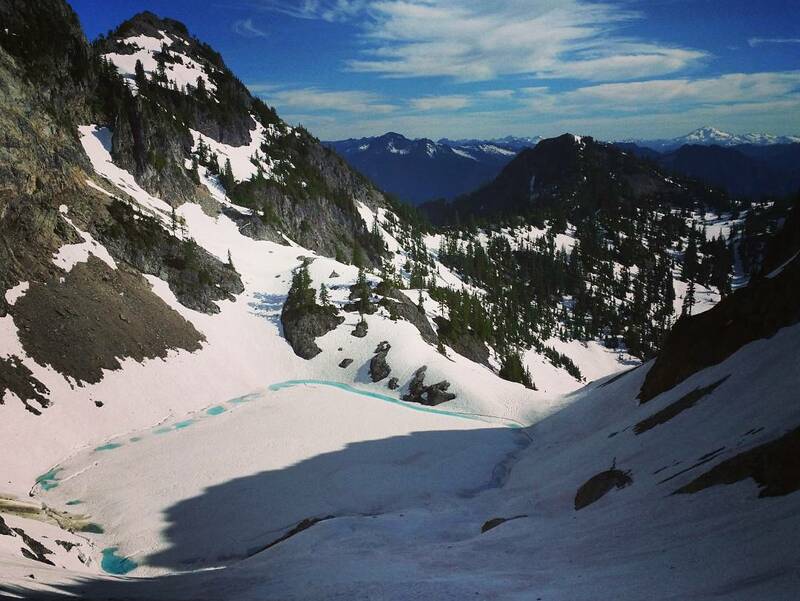 During the Melakwa Pass to Snow Lake traverse I used an ice axe and hiking pole. Personal comfort levels vary. To tighten up this traverse, parking at Alpental would be a better option, I left my car at Denny Creek in case the Melakwa Pass traverse just wasn’t my thing and I had to turn back. Mileage could also be reduced when the Granite Creek Connector TH is opened to the public. There are plenty of places to visit along the way if you have the time; summits, lakes, hidden mines, all kinds of adventure! …just remember to bring a map of some kind. There’s a lot of mountain out there!